P.B. Winterbottom? More like PC Winterbottom. Look what 2K Play just told us! 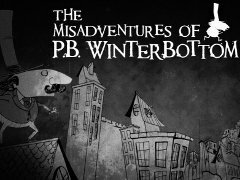 Hey, you can check out our review of P. B. Winterbottom right here! New York, NY – April 8, 2010 – 2K Play announced today that the critically acclaimed The Misadventures of P.B. Winterbottom will be available April 20, 2010 on Windows PC through Steam (http://store.steampowered.com/). Set in a world made famous by keystone cops, theater organs and pie-in-the-face slapstick, the inventive game has been heralded as a “big contender for DLC game of the year” by 1UP.com, who gave the game a perfect 100/100 score. The Misadventures of P.B. Winterbottom presents the comical escapades of the portly pie thief P.B. Winterbottom on his mad-capped pursuit of scrumptious brain-teasing pies that wreak frontal lobe havoc from the puzzle-filled euphoria of time manipulation and self-replication. Created by The Odd Gentlemen, The Misadventures of P.B. Winterbottom was originally released for Xbox LIVE® Arcade for the Xbox 360® video game and entertainment system from Microsoft. The Windows PC version is being developed by 2K China. The game will be available exclusively on Steam and comes with many new appetizing ingredients, including expanded leaderboard options, new unlockable Steam achievements, five additional brain-teasing puzzles and Steam Cloud, which allows players to take the game with them on the road by accessing saved games from the Steam network. The Misadventures of P.B. Winterbottom is rated E for everyone by the ESRB. For more information on The Misadventures of P.B. Winterbottom please visit www.winterbottomgame.com. It just so happens we will be reviewing the XBLA version of P.B. Winterbottom soon, so keep your eyes peeled.